We have tons of great gift ideas for any time of year! Whether you'd like to send a fruit basket or some of our amazing Honeycrisp Applesauce, we have what you're looking for! 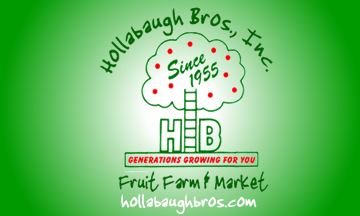 Hollabaugh Bros. Apple Butter is great with just about anything!! Eat with warm bread, cottage cheese or just by the spoonful! Choose from Sugar & Spice, No Sugar with Spice, or Sweetened with Honey. The ultimate gift from our family's farm! Everything in our Harvest Basket is made or grown locally - a bountiful gift! You have to try our Top Selling Jam - Peach Jalapeño Jam! Or give it as a gift - let someone else find out how awesome this stuff really is!! Our brand new Hollabaugh Family Cookbook is filled with delicious recipes from our employees, customers, friends, and family. This is the perfect addition to your personal cookbook library OR to give as a gift! We've put our fabulous apple products into this amazing basket! Includes apple butter, apple syrup, apple snitz, apple crisp mix and, of course, our delicious apples! Makes the perfect gift from "Apple Country USA!" We have tons of great gift ideas for any time of year! Treat your loved ones to a healthy basket of fruit and other goodies OR choose from a wide array of preserves, canned peaches, syrups, and more! !